Now the village aims to be a main feature in the festive calendar as the Deepdale Christmas Market goes from strength to strength. 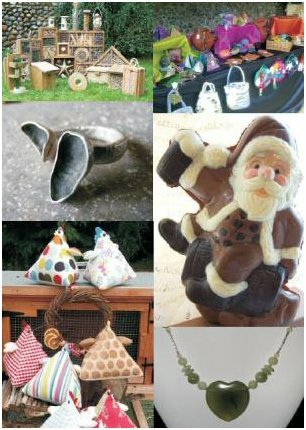 The second annual market on Saturday 4th and Sunday 5th December and will host over 50 stalls selling everything you need for the festive season - decorations, presents, food and drink. If its presents you are looking for then try something unique from Flutterby Crafts and Fudgydoo, something for the outdoors from Garden Habitats or pampering products from Aroma Natural. The Spindly Brindly Dog Company are sure to have something for dog lovers. Corryvreckan, Linda Ridd and Fi offer unique jewellery for that special loved one. A picture from Tim Hall or Photographic Art is sure to please and James Buttifant’s penquins are superb! Moreish cheese will be available from Lymn Bank Farm Cheese Co, savoury selection from Red House Kitchen, while Just Truffles and Rachel’s Cakes will most definitely please those with a sweet tooth. Enjoy some mead from The Grumpy Landlords, sort your Christmas wines with help from the Hunstanton Wine Cellar or if you prefer real ale then Beeston Brewery will make you smile. Of course the regular shops and café at Dalegate Market will be open throughout the weekend, as they are all year. Adults and childrens clothes from Fat Face, toys and gifts from Little Giggles, jewellery and accessories from Relish, pottery and art from The Hare & The Hen and everyday essentials from Keshco's Supermarket. The usual great food will be available from Deepdale Café with the added extras of mulled wine, mince pies and hot marinated turkey baps with stuffing and cranberry! Four charities are supported by the Christmas Market, each raising funds in their own unique way – RNLI, St Mary Church (Burnham Deepdale), Brancaster School and Brancaster Baby & Toddler Group. Last year over £500 was raised for charity. Don’t forget that extra Christmas spirit is available on Saturday evening (4pm to 6pm), when Hunstanton Concert Band will be performing Christmas tunes and carols. The St Mary’s Church Carollers will be supplying carol sheets for anyone wishing to join in, along with mulled wine and roast chestnuts. The stalls will all be open until 6pm too. Why not combine a visit to the Deepdale Christmas Market with a visit to the beautiful north Norfolk coast, take a walk or bike ride, visit the local pubs and escape the rat race for a couple of days. The Coasthopper bus service can drop you at the Deepdale Christmas Market and take you home again. If you can’t avoid the car then there is good parking and with a little notice we can accommodate coaches too. The 50 stalls and shops look forward to welcoming everyone to Deepdale on 4th and 5th December for Deepdale Christmas Market.